An ‘Intensive Personalised Employment Support’ programme is to be introduced which will “provide personalised employment support for long-term unemployed disabled people,” the new Work and Pensions Secretary Amber Rudd has announced. “Disabled people will be able to work with a dedicated key worker to get and stay in employment,” she says. The support comes from a new £40 million fund and is expected to benefit around 10,000 people. People will be provided with coaching to help build their independence, confidence and motivation, as well as work experience to help boost their career prospects. Rudd added: “Everyone, no matter what their background is, should have the opportunity to thrive in the workplace, and having the right support in place for disabled people is one of my greatest priorities. People on the scheme will be offered a dedicated key worker who will work with them to overcome complex barriers which may be preventing them from entering work, ensuring they have a personal support network in place. The Intensive Personalised Employment Support programme will support people living with a disability who are unlikely to move into work within the next year or longer and may need additional support. Other existing government support to help disabled people get into and stay in work includes the Disability Confident scheme, the Work and Health programme, the Access to Work grant and Jobcentre Plus services. However, an alternative explanation is that those who are not employed because of a health condition for longer periods are simply too ill to work. Nonetheless, the government has focused on notions of “work-readiness” as a means to “help” disabled people into work, which tends to sidestep the barriers that people face because they are unwell. Research was carried out by IFF Research Ltd on behalf of the Department for Work and Pensions, to evaluate the Personalisation Pathfnder trial, which was introduced in April 2015 in three Districts: South West Wales, Surrey and Sussex and Greater Wessex. The report can be found here. Any impacts on the reputation of DWP and/or Jobcentre Plus among claimants. The chief purpose of the Personalisation Pathfinder was to help claimants to become “work ready” through offered tailored support to those with a disability or health condition who are unemployed and aimed to investigate the impacts of an approach focused on personalisation, flexibility, peer support, and integration with local support. The report discusses findings from two waves of a quantitative survey with claimants on the Personalisation Pathfnder as well as from qualitative interviews with claimants and Pathfnder stakeholders. Job seeker’s Allowance (JSA) claimants with a health condition or disability accounted for the greatest proportion of participants on the Pathfnder (50 per cent), followed by Employment and Support Allowance (ESA) pre-Work Capability Assessment (WCA) claimants (38 per cent). Only around one in eight (12 per cent) of the participants were ESA Work Programme completers (WP). The majority of participants had been in employment at some point before joining the Pathfnder (76 per cent). Six in ten had left their previous employment due to health related reasons and more than seven in ten regarded their health as a key barrier to returning to work. Perhaps unsurprisingly, participants claiming JSA were generally less likely to perceive their disability as impacting on their employment before joining the Pathfnder. They were also less likely to believe their health condition or disability limited their ability to return to work. They tended to report fewer barriers to returning to work and were therefore generally more positive about this prospect. Three in ten claimants were in work twelve months after joining the Personalisation Pathfinder. ESA pre-WCA claimants were most likely to have found work while on the trial. Nearly a third of this group had, however, returned to a previous employer or job. ESA WP Completers were the least likely to have found work, but the ones who did were more likely than the other claimant groups to credit the support they received from the Pathfinder in moving them into work. ESA WP Completers were also more likely to feel they needed health related support that the Pathfinder could not offer and that this prevented them from moving closer to employment. The authors clearly stated that it is not possible to assess from the research what proportion of claimants would have achieved these outcomes without the assistance of the Pathfinder. Although there are indications of “work-readiness” improving among those who did not find work – and I am not sure how one measures that – improvements in wellbeing and social isolation, it was concluded, were “more modest”. The research was framed by the political application of the theory of change – this is essentially a description of how and why a desired change is expected to happen in a particular context. It is focused in particular on mapping out or “filling in” what has been described as the “missing middle” between what a programme or change initiative does (its activities or interventions) and how these lead to desired goals being achieved. It does this by first identifying the desired long-term goals and then works backwards from these to identify all the conditions (outcomes) that must be in place (and how these related to one another ‘causally’) for the goals to occur. Government sectors use the theory of change to promote various managed social and political changes, to define their long-term goals. So it is a model based on backcasting, which is a planning method that starts with defining a desirable future and then works backwards to identify policies and programmes that will connect that specified future to the present. The outcomes in a theory of change must be coupled with indicators that guide and facilitate measurement. The measurement is often of changes in behaviours and perceptions. However, any serious explanation of anything in the social world should be suspect if it only uses one theory – e.g. a theory of financial incentives, or peer influences. All successful models are assemblies of multiple elements and theories – and they are open to exploration. Anyone familiar with systems thinking will be dubious of linear explanations, especially where complex phenomena like disability, emloyment, homelessness, poverty or social isolation are concerned. On key problem with the theory of change is that it does not model how events happen; rather, it models how strategists believe things will happen. Theory of change is a forecast that shows what conditions they believe must exist for other conditions to come into being. It’s easy to see how the model may very easily accommodate assumptions, prejudices and channel bias. The model may confuse accountability with ambitions and hopes. Often, theory of change is insular and parochial, too. It can fail to take the external context into account. This is an important criticism in the context of current government behaviour change programes, as the emphasis is entirely on individuals, who are somehow viewed as detached from their social, cultural, economic and policy contexts. “The voluntary issue is quite interesting actually, because I have had people who have come back from the Work Programme, have sat down in front of me and you can tell have arrived expecting me to say, ‘Right, you’re going to do this/you’re going to do that/you’re going to do this’, and they’ve been quite defensive, and they’ve said, ‘You know I can’t work. “I did not feel I could say no to the Pathfnder, because if we don’t do what they say, they’ll stop our money.” (JSA Caseload claimant, Surrey and Sussex). Another criticism of the pathfinder is that it does not seem to differentiate between perceived health-related barriers to work and actual health-related barriers to work. Part of the aim of the programme was to influence people’s perceptions of barriers, a strategy which had little impact overall. 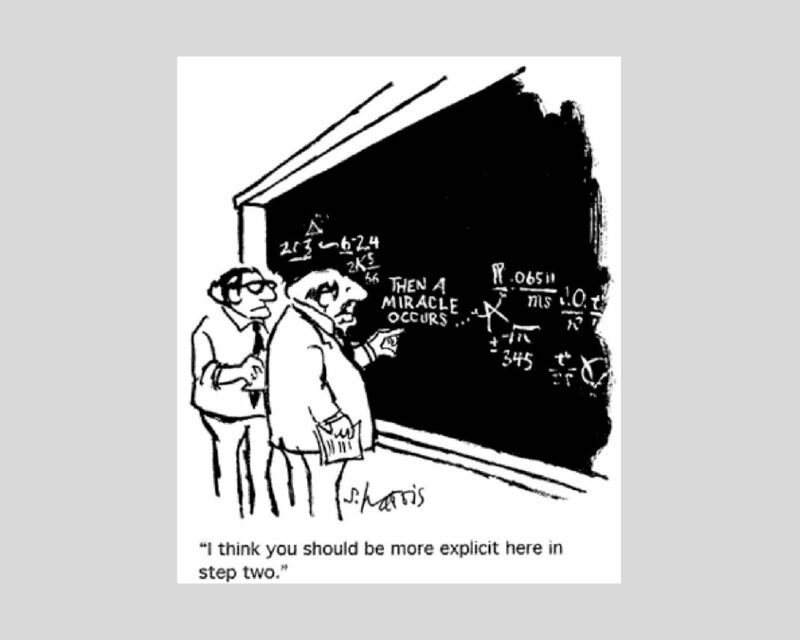 Another problem with the theory of change approach is that it doesn’t confirm the plausibility of the theory. Also, to be able to test, refine, and improve a theory of change over time, you need to be able to accurately measure its key elements. Not differentiating between perceived and actual health-related barriers leads to measurement problems. Another major criticism of applied behavioural scientist Kurt Lewin‘s theory of change model is that it ignores the influence of organisational power, conflict and politics; it is “top-down” and management-driven. As such, it is rather an authoritarian approach to policy making. This is down to a misuse of the original theory and its underpinning intents. This presents an irony given that Lewin’s original wish was to extend democratic values and resolve social conflicts. Even critics of Lewin’s work have drawn on his Field Theory to develop their own models of change. Including the government. Any change that the Conservatives initiate is generally imposed on others and micromanaged. If prescribed, theory of change quickly becomes a compliance exercise and loses much of its original value. Theory of change frameworks requires a commitment to anopen, reflective and realistic approach. Assumptions reflect deeply held beliefs, norms and ideological perspectives. These inform the design and implementation of programmes. The quality of a theory of change process rests on ‘making assumptions explicit’ and making strategic thinking realistic and transparent. Power relations, both in the programme’s context and within organisations, limit the ability to challenge established ways of thinking and working. So a theory of change process often brings to the surface conflicts and tensions which require negotiation. It’s certainly true to say that some “politicians, like any other social group that is in a rarefied or tightly knit, small community, will frequently suffer from psychological ‘groupthink’.” Dr Paul Taffinder, Chartered psychologist. I don’t make any money from my work. I am disabled because of illness and have a limited income. But you can help me if you like by making a donation to help me continue to research and write informative, insightful and independent articles, and to provide support to others. The smallest amount is much appreciated – thank you. Full-time specialist disability employment advisors who are posted in jobcentres have been radically reduced since 2011. The full-time advisors are employed to help disabled people navigate the support system and find employment. Over the last four years, the number of specialist advisors fell by over 60 per cent, from 226 to just 90. The government says that the advisors will be replaced by unqualified non-specialist “work coaches” as part of its Universal Credit programme, which also extends welfare conditionality, entailing sanctions, to people in part-time and low paid work. 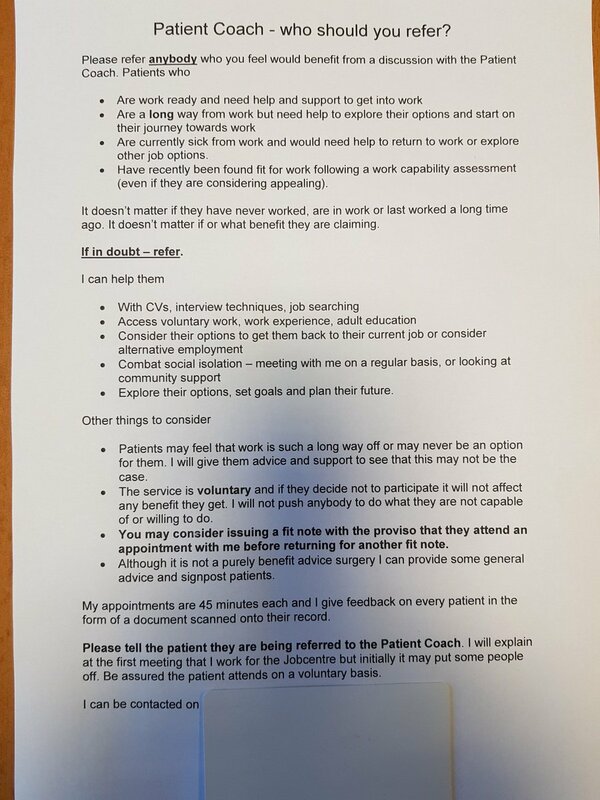 We reported last week that the work coach scheme is to extend from jobcentres to GP practices, to prevent sick and disabled people from “leaving the job market” and “claiming Employment Support Allowance” (ESA), with pilots already underway. The latest figures on jobcentre advisors were released by ministers in response to a Parliamentary question by Labour MP Emily Thornberry. A spokesman for the Department for Work and Pension said the fall in advisor numbers was consistent with Government policy. The government have also cut in work support for disabled people, such as the Access to Work fund, which helps people and employers cover costs of disabilities that may present a barrier to work. Under the Equality Act, employers are obliged to make “reasonable adjustments” to the workplace to support people with disabilities. A coalition of 100 disability charities had warned that the government cuts threaten disabled people’s rights earlier this year, and last month, especially those with learning disability and mental health problems, charities also called for a halt in the government’s cuts to ESA, which will be reduced, removing the work-related activity component, so that people will receive the same amount as jobseekers with no disability, which will make it more difficult for disabled people to find work, and may have an adverse impact on people with health conditions. Duncan Smith commented at the Conservative conference: “We don’t think of people not in work as victims to be sustained on government handouts. No, we want to help them live lives independent of the state. “Disability employment advisors make a huge difference in supporting disabled people into work – providing expert, personalised advice and guidance. “Some find them impossible and we are worried that there is not the right support in Jobcentres to help them. Families tell us that a lack of learning disability training and cuts to DEAs is leading to many people with a learning disability being unfairly sanctioned and receiving insufficient support to appeal decisions, or the right support to find employment. A recent Freedom of Information request showed that between April, 2014, and March this year there were almost 20,000 benefit sanctions received by people who were out of work because of their mental health.